First off, I want to tell you that I’ll be heading to Michigan for ten days to visit family, so this will be my last post for a couple of weeks. I’ll continue to update adoption news of Blog Dogs on my WHS Facebook page while I’m gone (you can click on it in the right margin). I have a lot of happy news this week! 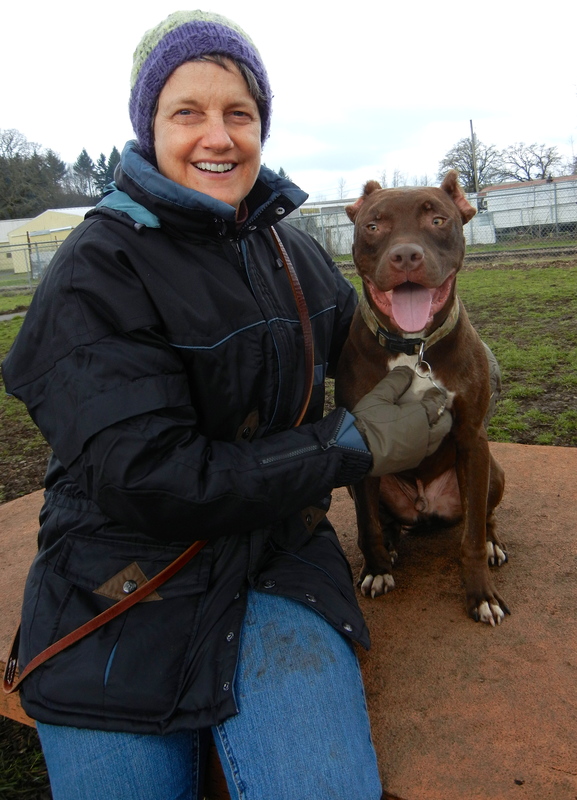 You will remember that Rockstar was spending time with WHS Certified Pet Dog Trainer, Annie, and doing so well. 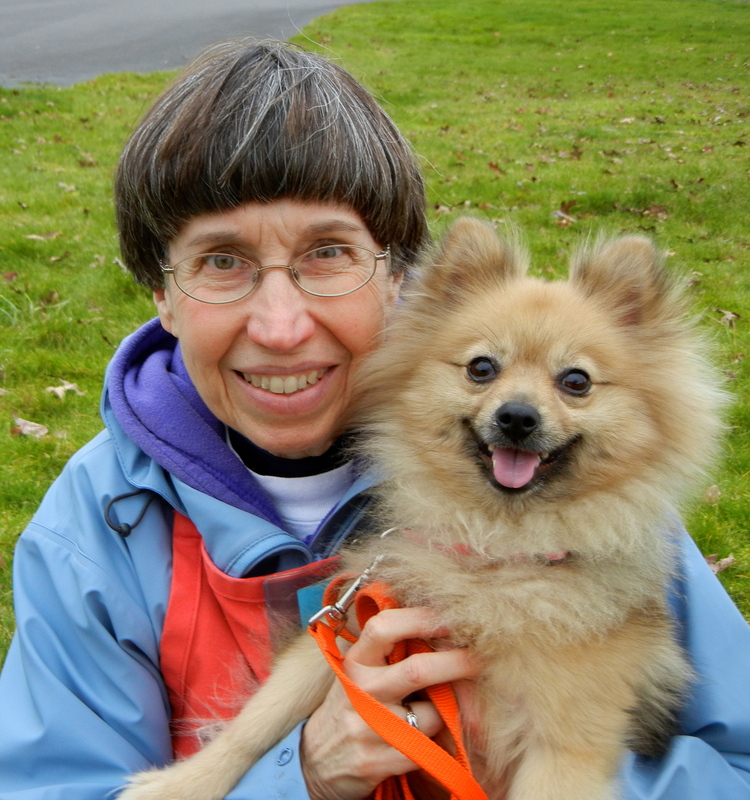 I happened to have lunch with former WHS volunteer manager, Karen, on Thursday and told her how Rockstar was getting along with all of Annie’s animals including her chickens, cats, and elder dog. Karen’s eyes lit up and she said she might be interested in fostering him. Karen has cats, chickens, a bunny, an older Border Collie named Bailey, and a horse, so Rockstar sounded like he’d fit right into the family. 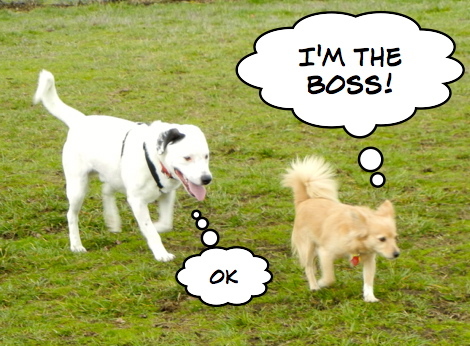 A meeting was set up for Rockstar to meet Bailey to make sure Bailey could tolerate Rockstar’s youthful antics. Linda, who has worked a great deal with Rockstar, was also there to give Karen tips. 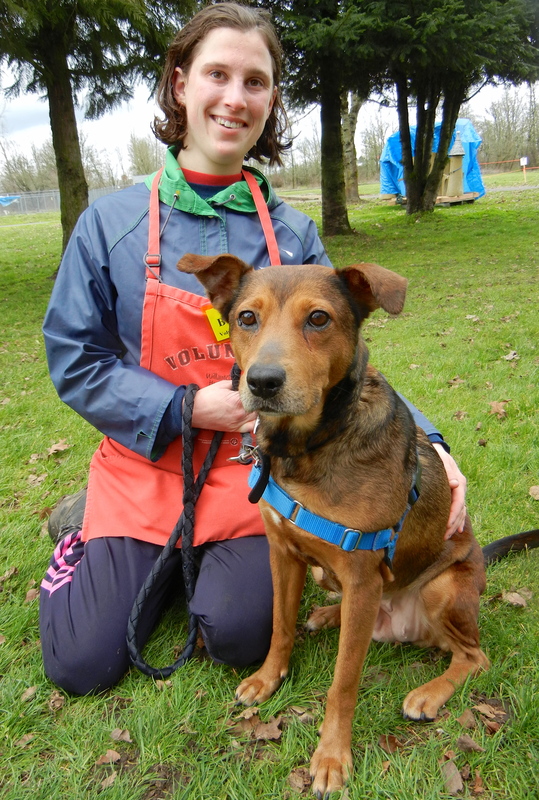 Everything went well and Rockstar has been with Karen since Friday evening. Sunday Karen brought Rockstar to play group and I shot this picture of them. She’s changing his name to Tanner (it’ll take me awhile to get used to it, but I like it!). Of course, bringing a new dog into a family never goes flawlessly, and Rockstar was no exception. Karen quickly found that a foam-filled bed was not the best choice for the boy. And, a typical teenager, Rockstar tried to blame someone else! 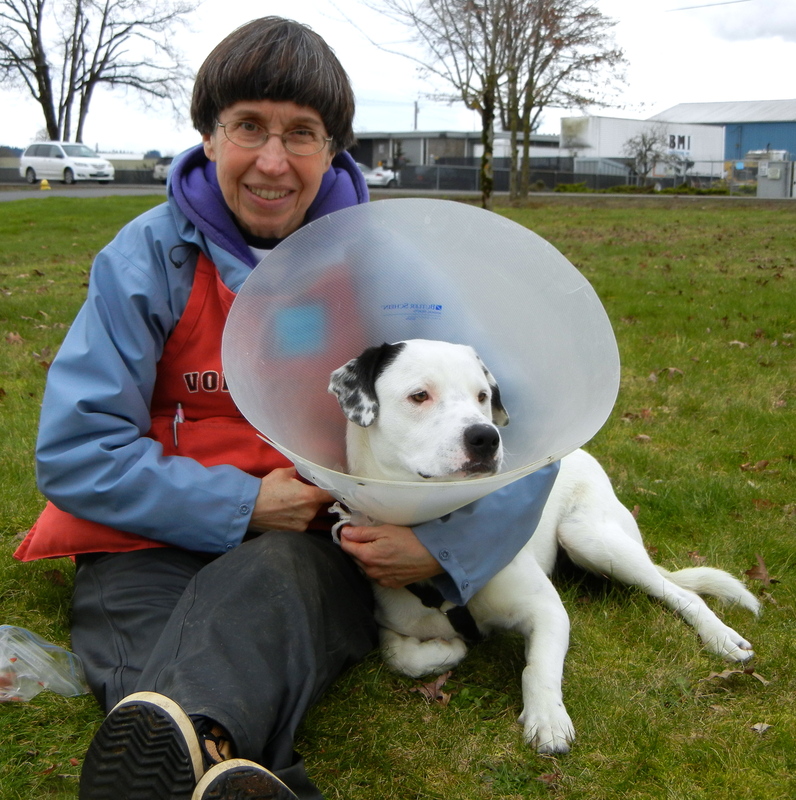 One last quick update from Karen on Tuesday morning: “Tanner continues to do really well – he’s an awesome dog. Today he invited the bunny to play with a play bow and a jump. The bunny didn’t respond and I told him to leave it, so he now avoids the bunny. He can be loose in the house at all times when we are home. 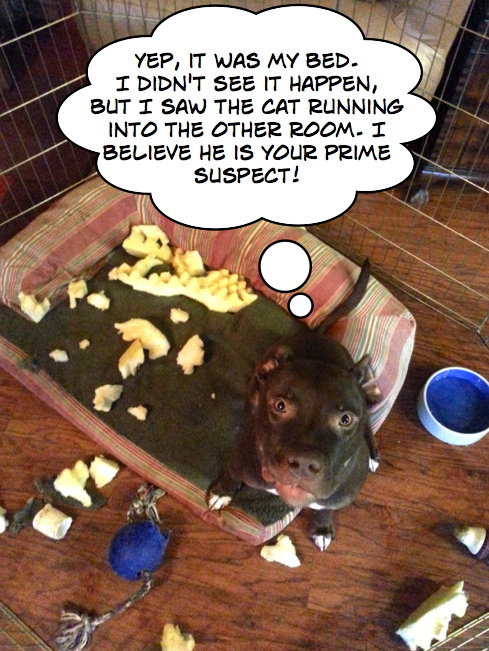 No accidents – Annie did a great job housebreaking him. Hot dog bits really help his training. I can call him from way across the pasture and he now comes to me like a bullet.” Wow! Tanner is a real Rockstar! 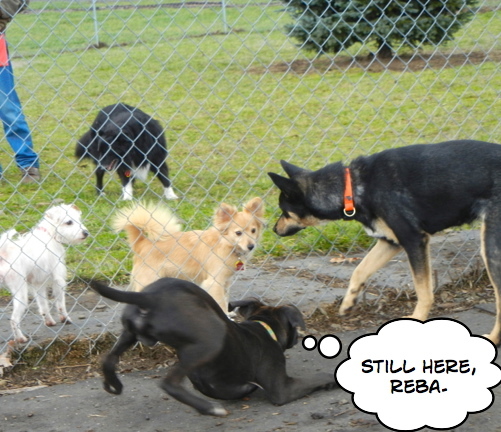 Sunday’s play group was fun to watch, as always, and there was lots of chatter. 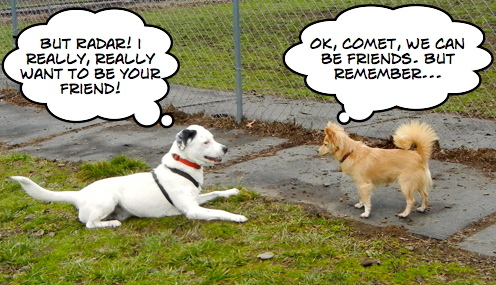 Comet, one of my current favorites, wanted to make friends with Radar, one of staff member Kim’s dogs. Radar has always been a big dog in a little body. 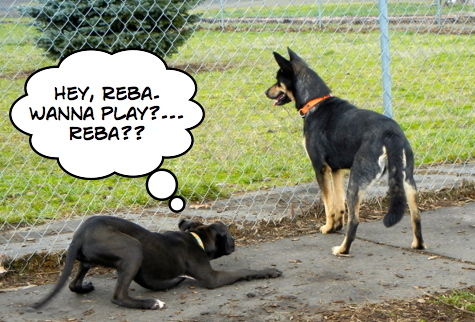 Then there was the Sport and Reba Show. This went on for several minutes. 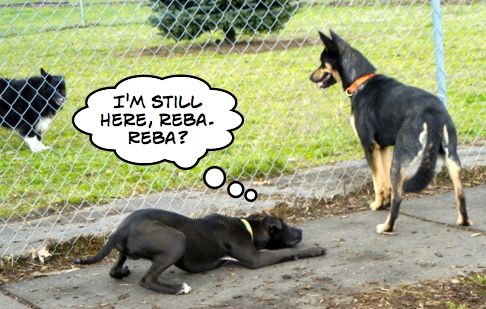 Sport wanted Reba’s attention so badly! 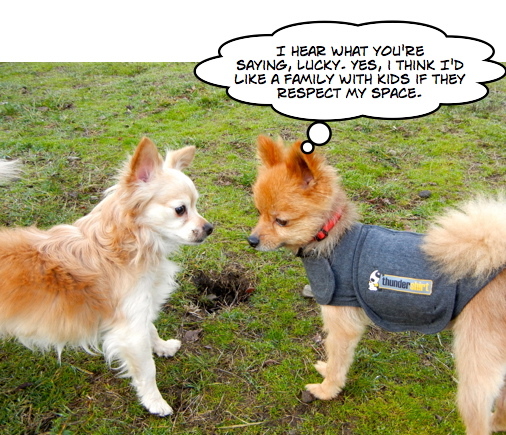 I just happened to overhear this “Dear Abby” exchange between Bugsy and Lucky. 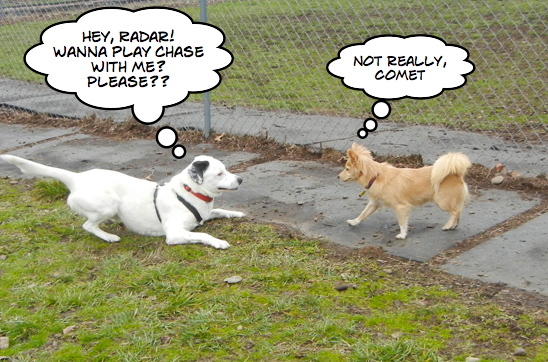 I visited the mellow-dog play yard and couldn’t help but pick up Bugsy for a bit. He is such a character with a huge personality. 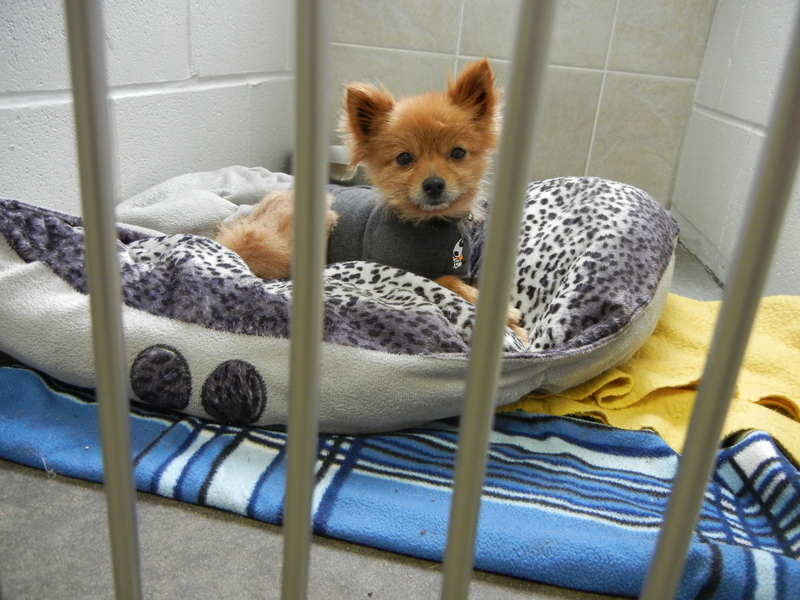 He is a six-year-old Pomeranian mix who is such a cute, playful, little guy! I’m surprised he’s still at the shelter. He sometimes barks in his kennel, but it’s all for show! 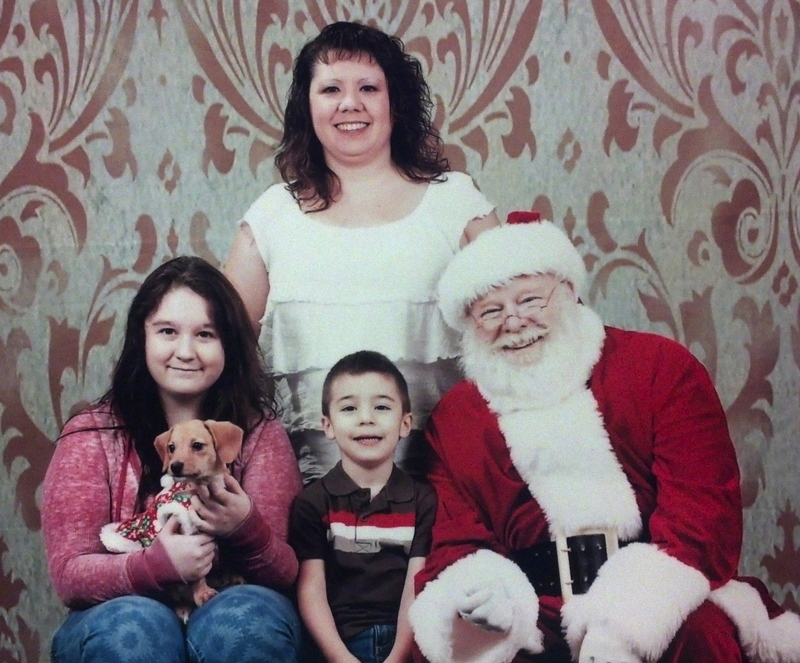 I’m looking for a family that likes Dachshunds! 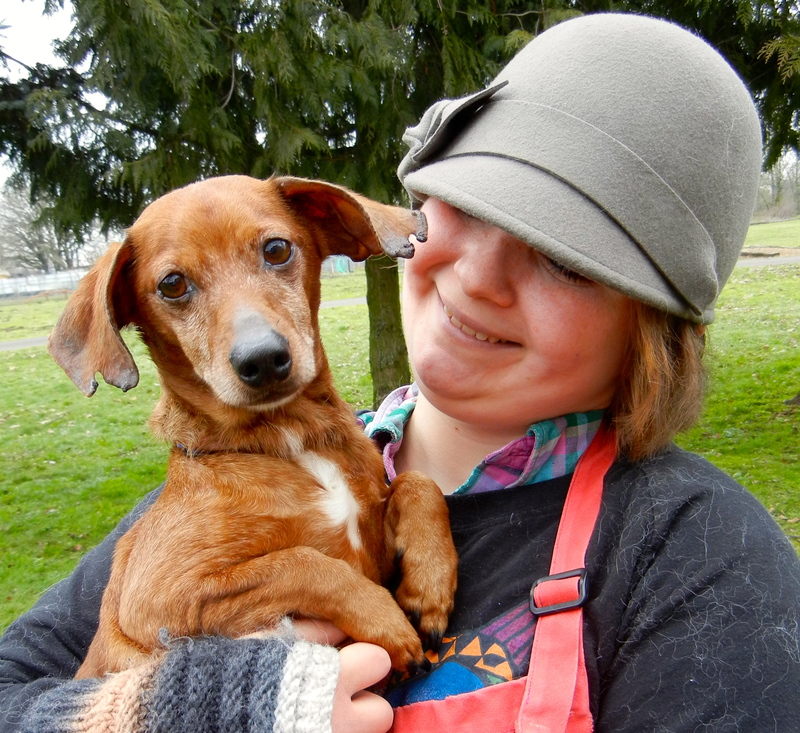 Sarah and I met a new little Miniature Dachshund named Joey who is five years old. 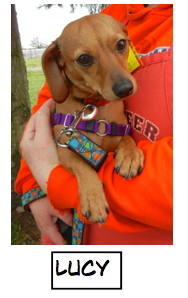 He is a calm, affectionate, quiet little dog who will make a great companion for a Dachshund-lover. 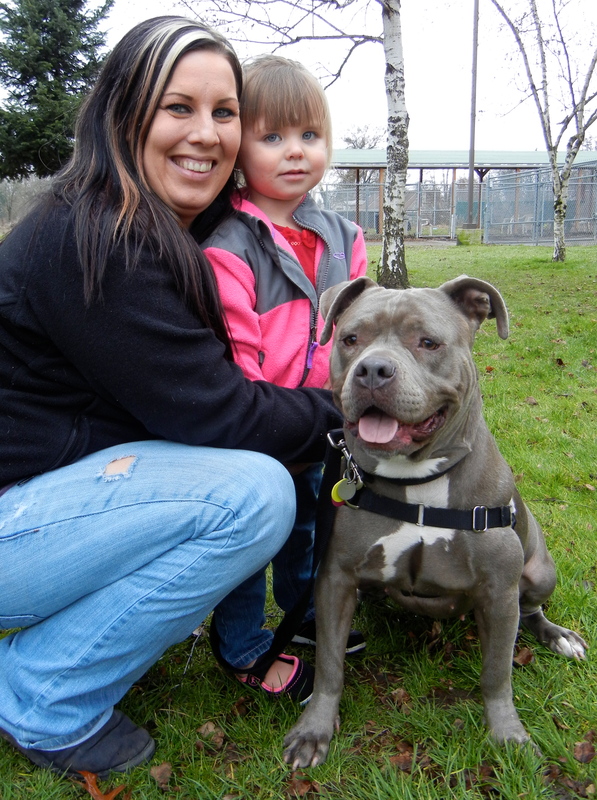 He walks well on leash, takes treats nicely and enjoyed being held in Sarah’s arms. He’s a very sweet little boy. 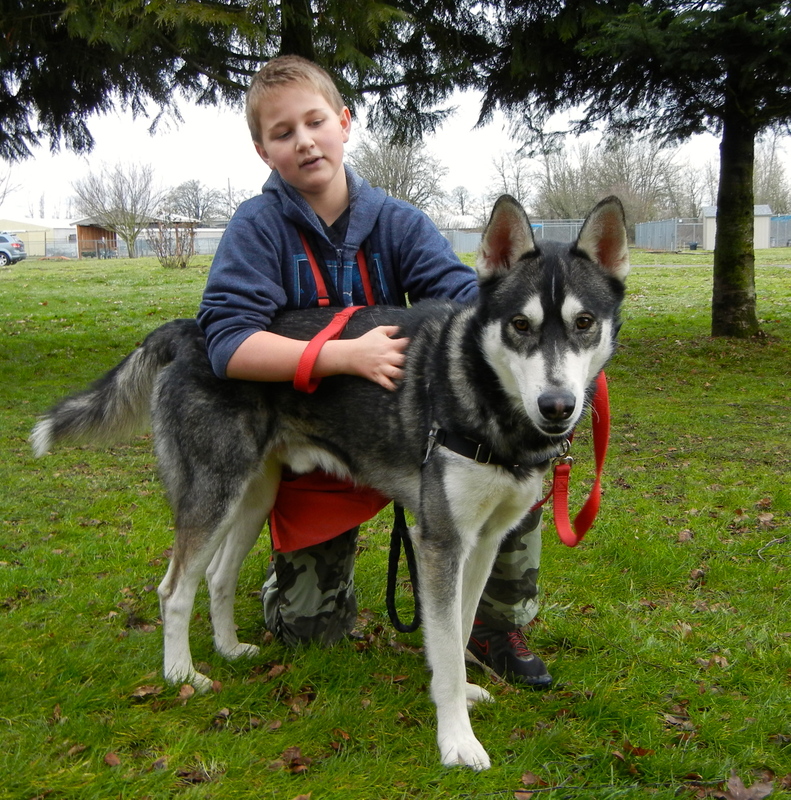 Another newbie is Buck, a two-year-old Alaskan Malamute mix. 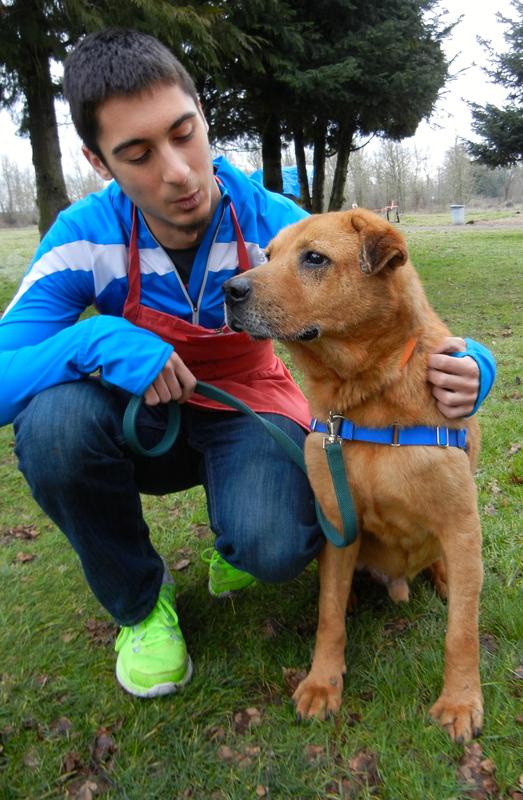 He’s a big, enthusiastic boy and will need an active family to keep up with him. He knows several commands and sat politely for pictures in return for hot dog bits. He already is on hold, so I’m hoping he’ll go home very soon. Here he was Sunday with Luke. Buck is a very handsome guy! I may be small, but I have a big heart! 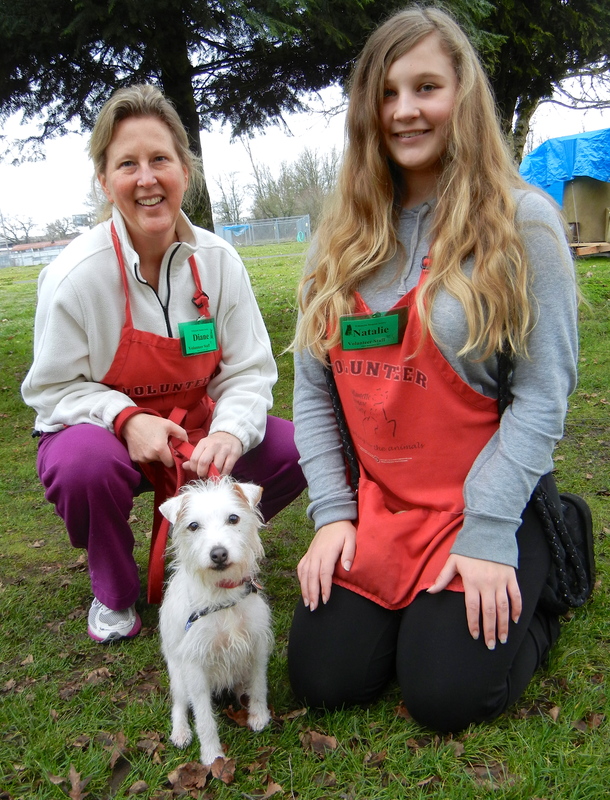 Also on Sunday I saw volunteers Diane and Natalie with little Candi, a two-year-old Jack Russell Mix. 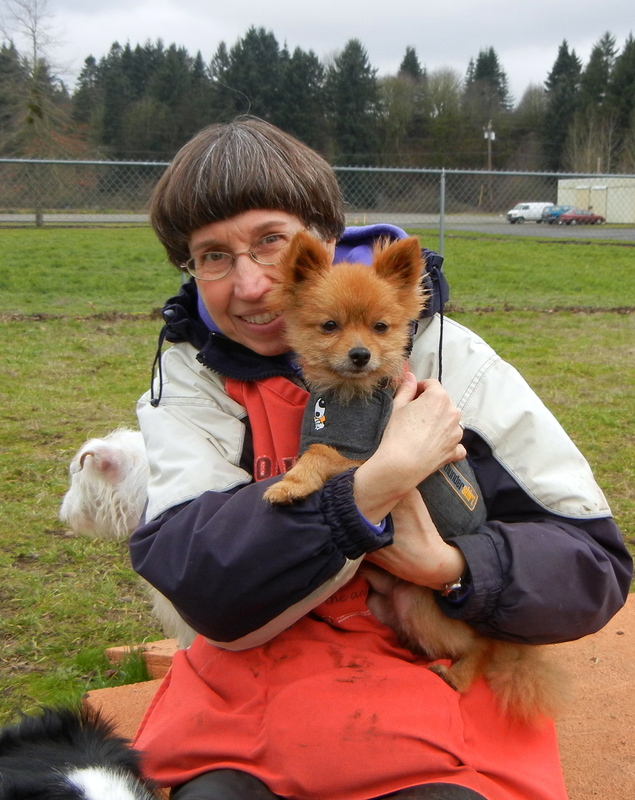 Candi had a great time in play group and got along with all of the other little dogs. She knows several commands and is eager to work for treats. She does need a little help with house training, but being as smart as she is, that shouldn’t be much of a problem. She is a sweetheart! 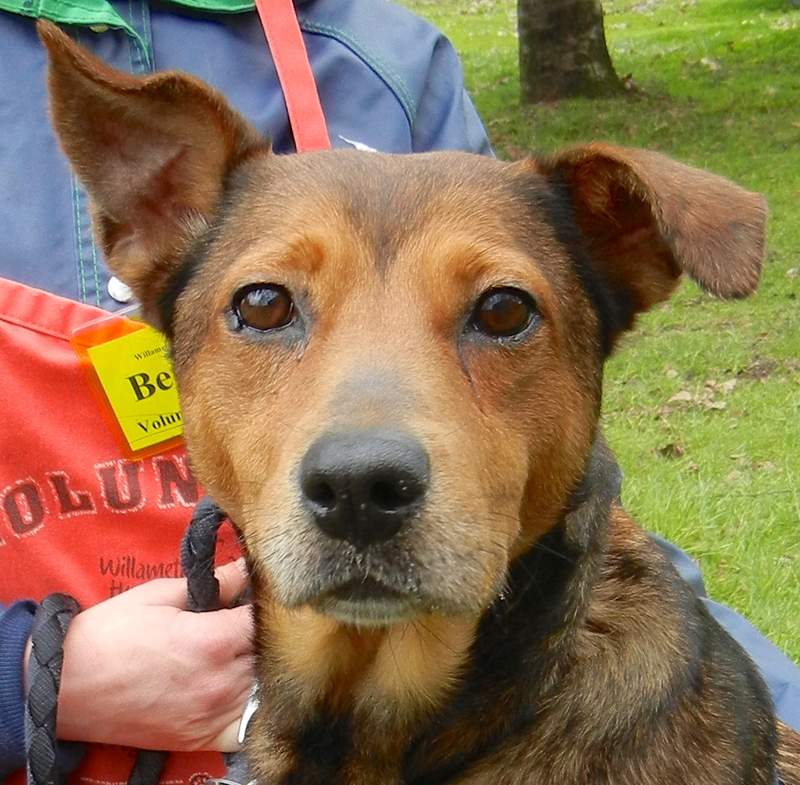 Meet Bo — shy, gentle, and handsome! This is Bo. I met him on Monday. 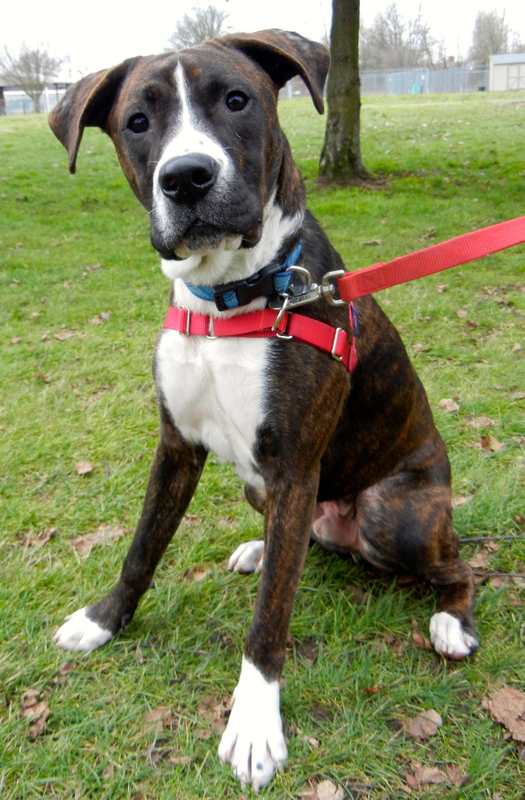 He is a one-year-old Boxer mix. He was very confused about being at the shelter and shy in his kennel at first, but once he realized I wanted to be his friend, he was happy to pose for me. He is wonderful! He has a good history with other dogs and kids. He even likes cats, but is a bit too excited around them. 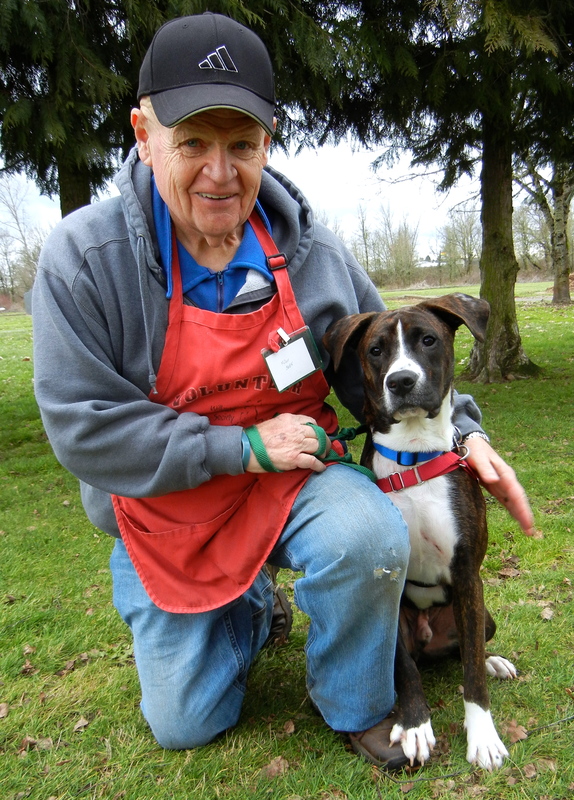 He will make some lucky family a fantastic new best friend! Bo is quickly becoming a favorite of many! Here he is today with Kathy. When I asked Larry to pick out his favorite dog today to get a picture with, guess whom he chose? I’m sure most of my readers have heard about the dogs that were seized in the Brooks animal neglect case a few weeks ago. 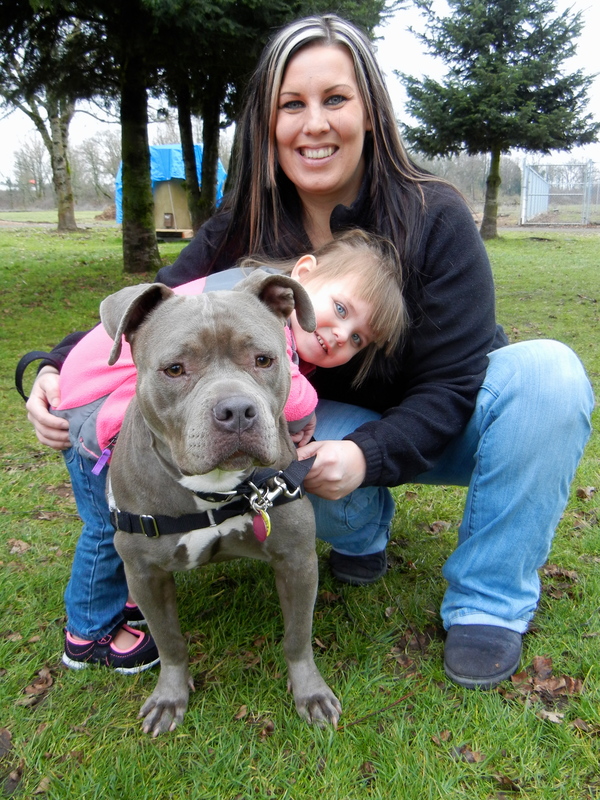 Of the 140 dogs rescued from the warehouse, WHS took in 14 of them. They have been being cared for both in the shelter and in foster homes and have been gaining strength, weight, and confidence. 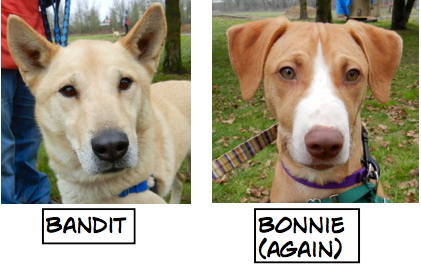 Four of these dogs are now ready for adoption. They will be available on Thursday, Valentine’s Day. 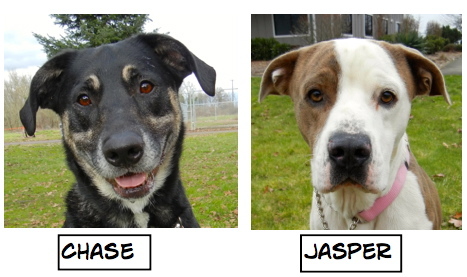 Here are three who are at the shelter, a fourth is in foster care. 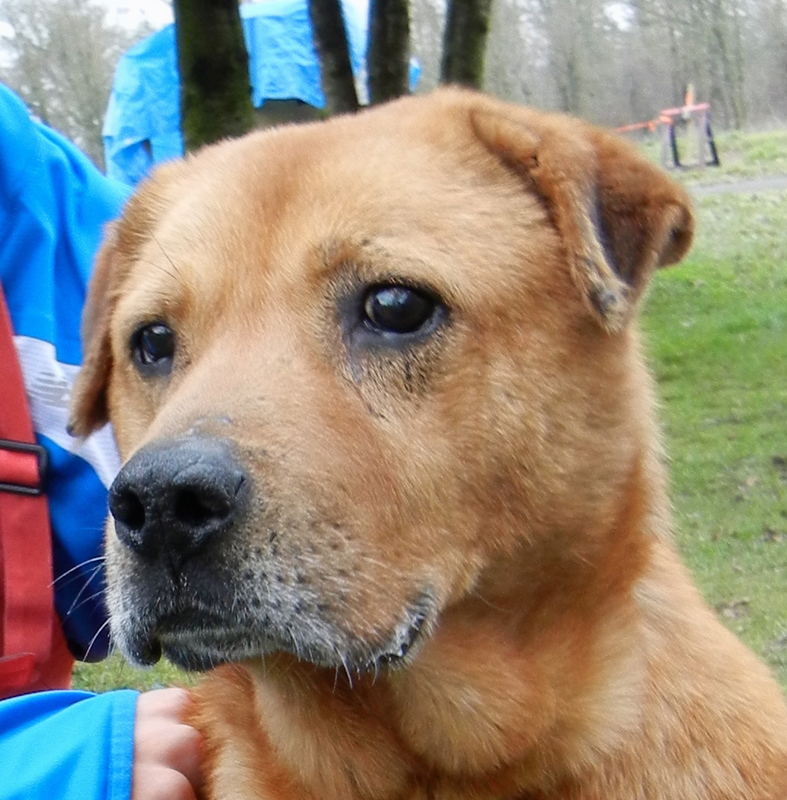 This is Hank, a five-year-old Chow Chow mix. As you can see, he is a gentle soul who is willing to love again, as he showed Andrew. 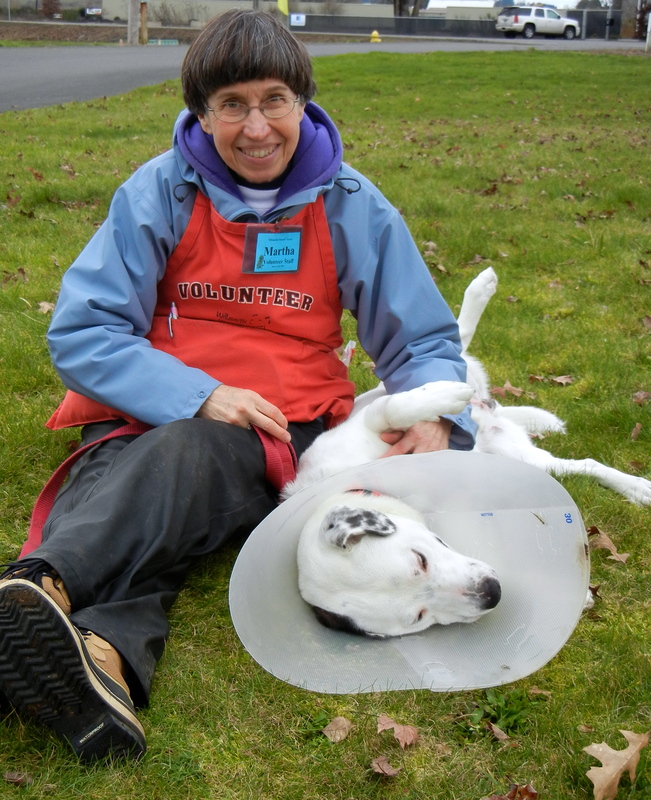 Hank is such an affectionate boy that he has many volunteers totally smitten, including Beth and Marla. Hank came to us with a hurt front leg, and now walks with a limp. He is a little nervous at first meeting, but as you can see, he quickly shows his willingness to trust again. 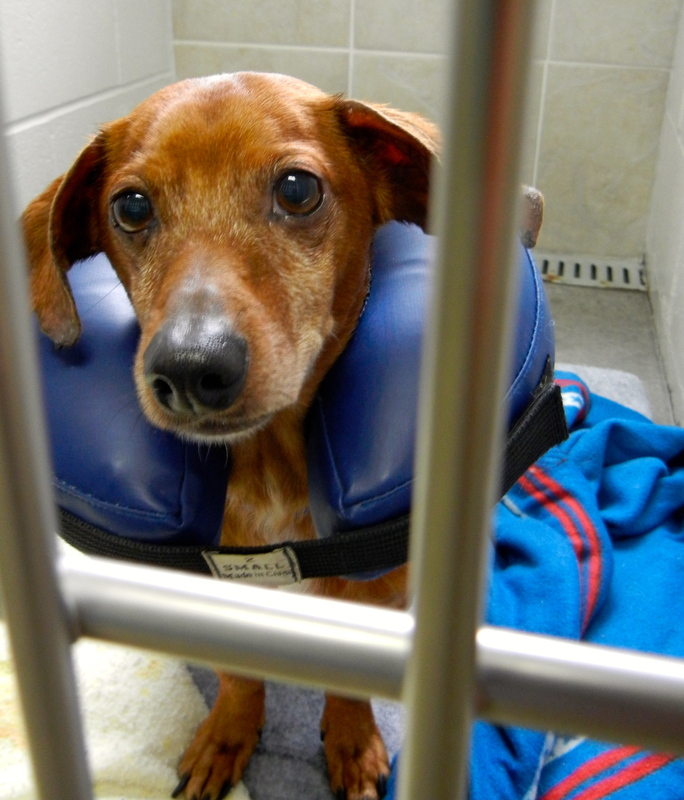 This is little Hope, a three-year-old Dachshund mix who was very under-socialized when rescued, but has spent the last week in intense dog-manners training in a foster home. 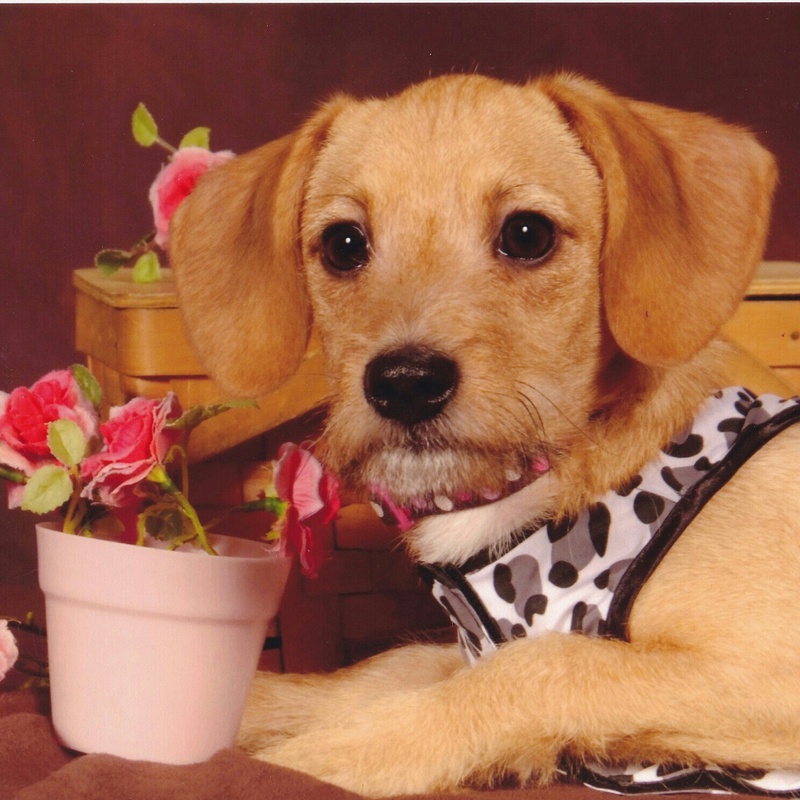 She has made great strides, but will need a family who will continue with her socialization and manners work. 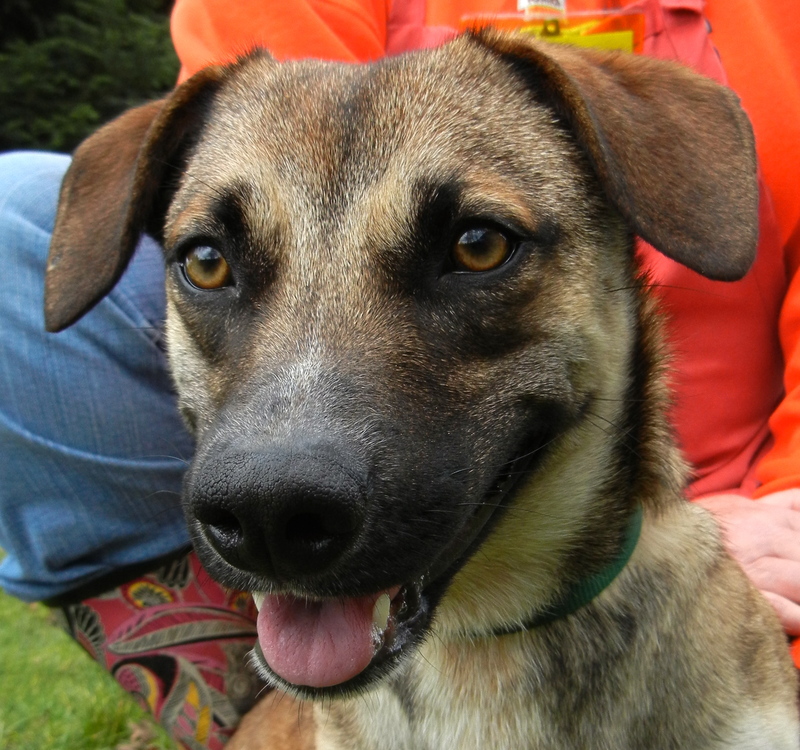 She gets along with other dogs and has blossomed into a happy girl during her stay with us. Sarah spent some time with her on Sunday. Here she was today with Debbie. This afternoon was the first time I saw her smile! 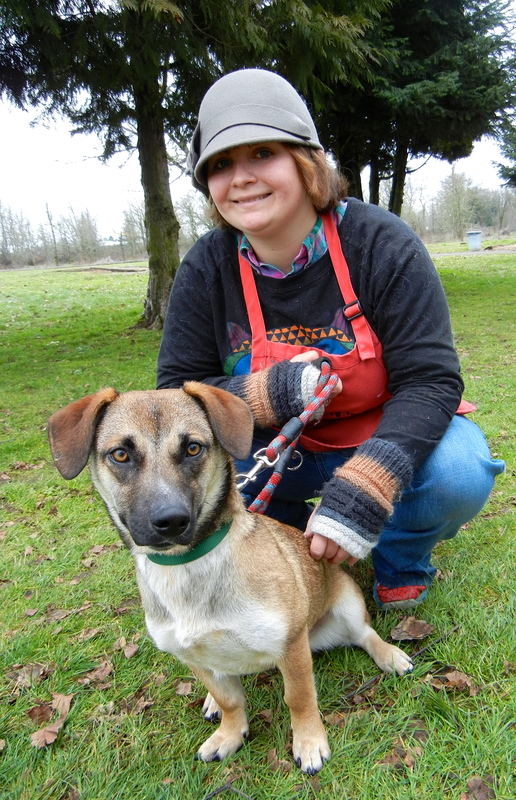 This is Sundance, a four-year-old Alaskan Husky mix. 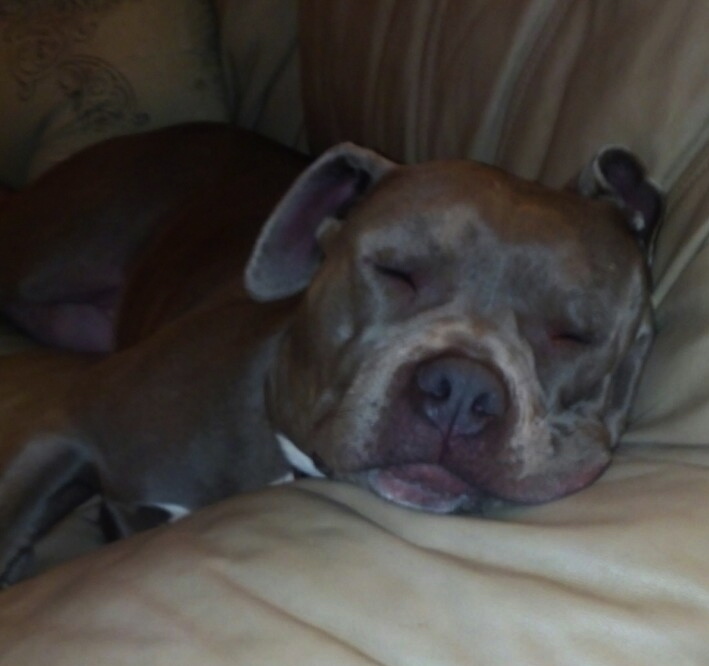 Like Hope, she was very under-socialized when she was rescued but has improved dramatically. Today Bethany spent time with her and said she walked quite well on leash. She is gentle and took my treats carefully. She is enjoying getting used to being inside and will need a patient and understanding family who will continue to help her with potty training and socialization. I wish I knew what she is trying to say when I look into her eyes. 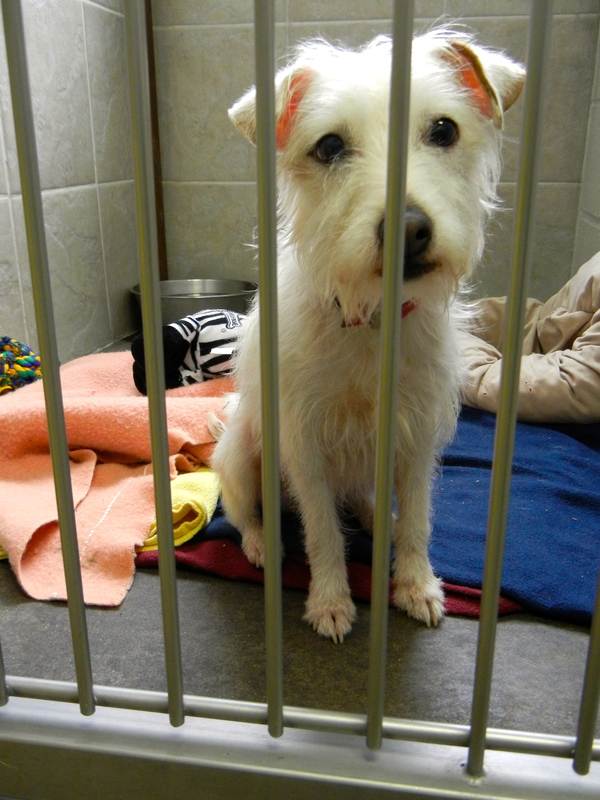 Before I left the shelter on Sunday, I happened to be in the Small Dog room. Everyone was sitting quietly in their kennels and I decided to take some pictures to show these precious little lives waiting for their new families. 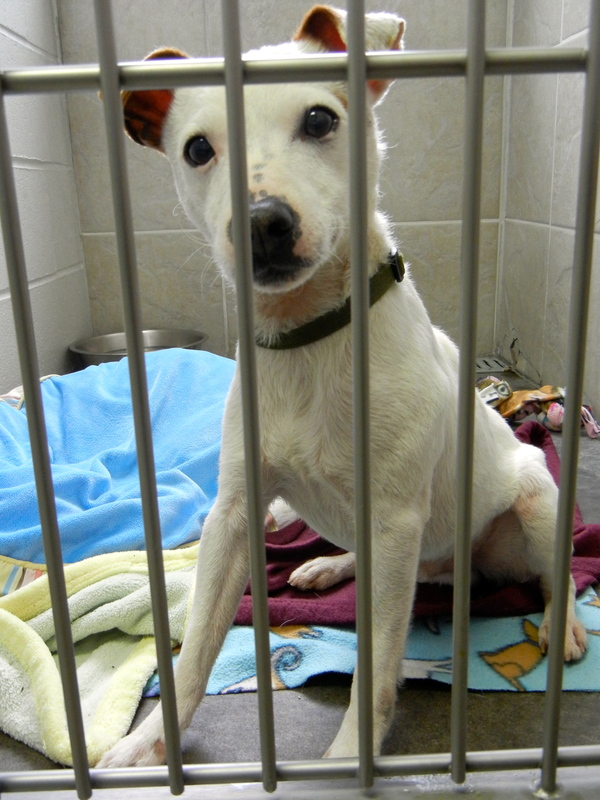 I’m back at the shelter hoping for a puppy-loving family. 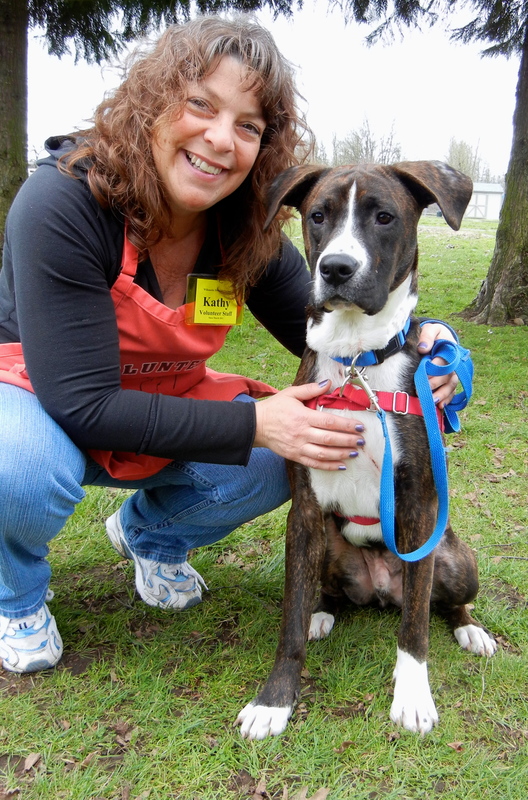 One of the dogs that Kathy walked today was Harley, an eight-month-old Lab mix who is all puppy. 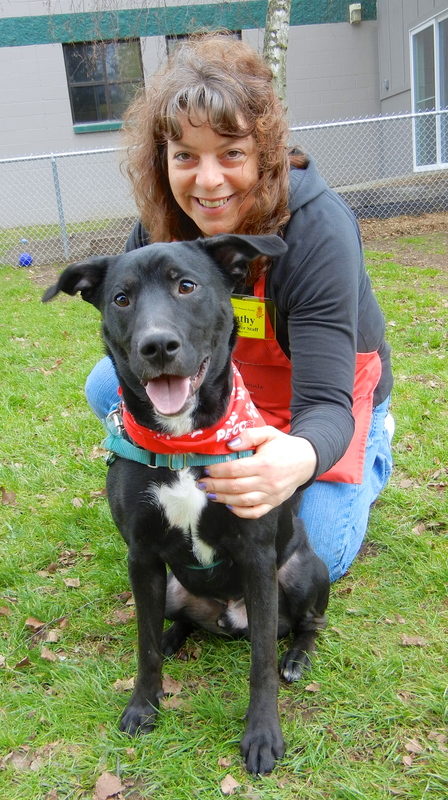 If you love the challenge of teaching an enthusiastic and happy pup what life is about, Harley might be the one for you! He is a perfect fit for some of the WHS training classes. Harley really wants to be a good boy, it’s just that when you are eight months old, there is so much excitement all around you and it’s very hard to keep all four feet on the ground. He already knows how to sit (as long as I snapped the camera fast) and is eager to learn many more things. Kathy and I are hoping that someone with patience and understanding will accept the challenge! Looking for a more relaxing best friend? 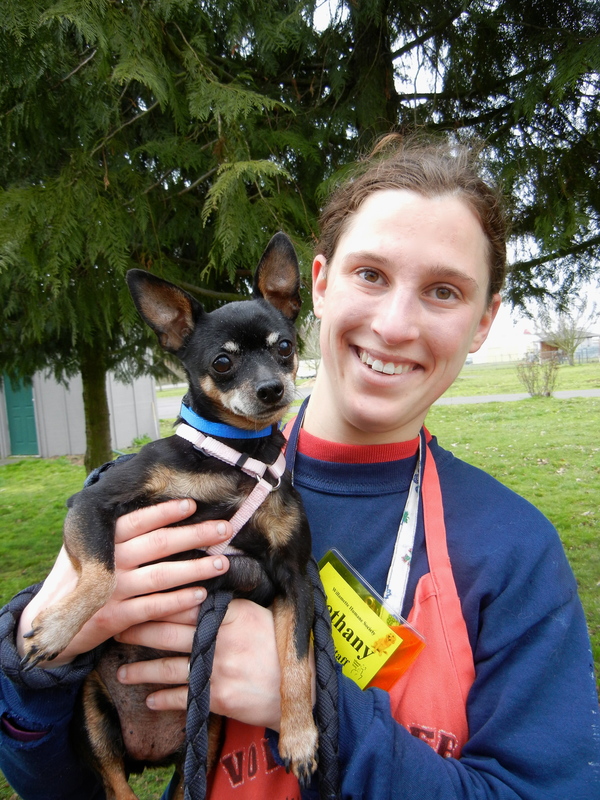 If you’re not up for puppy training, how about nine-year-old Ping Pong, a Miniature Pinscher/Chihuahua mix? 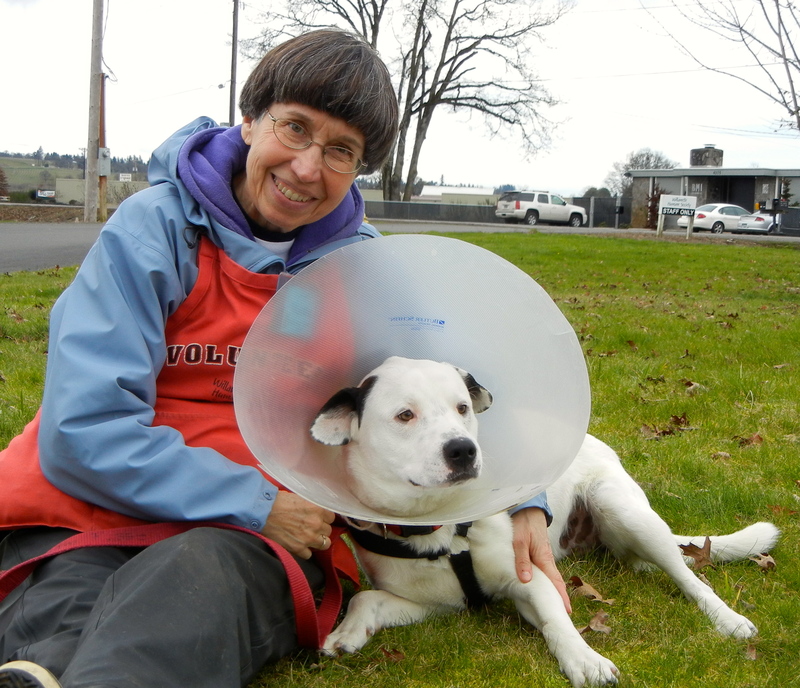 Ping Pong is a laid back kind of guy who enjoys leisurely walks, sitting in your lap, being carried, well, you get the picture. 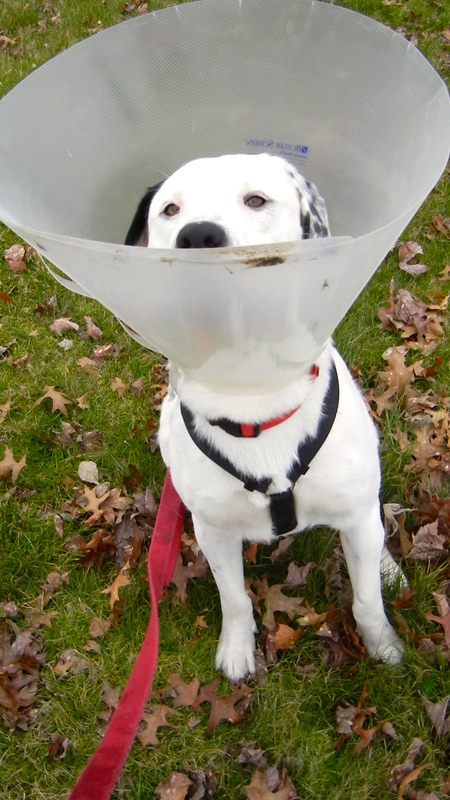 Ping Pong doesn’t like to admit it, but he could use a little less kibble and a little more exercise. 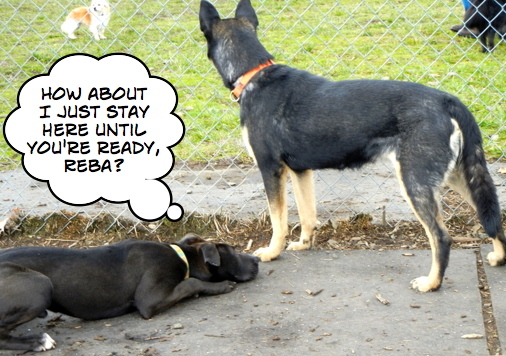 He does enjoy play group and did dash around the yard for awhile last week. 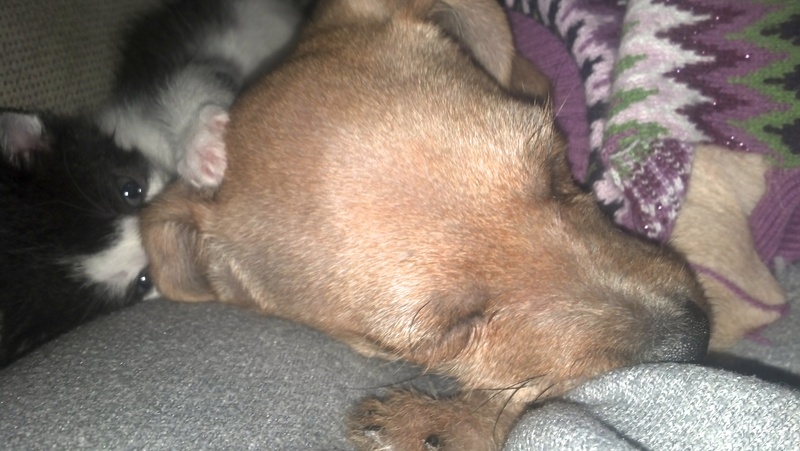 He’s a great little dog and will make someone a loving companion. If you’re into fluffy, that would be me! Meet Luna, a very happy three-year-old Pomeranian mix. She is absolutely adorable, and I don’t use that word often. She walks with a spring in her step, and there is no doubt in her mind that she is a princess. She does well with kids and is friendly to everyone. She smiles constantly and will be a great family addition. I’m a favorite around here! My last dog of the afternoon today is one of my current favorites, Comet. 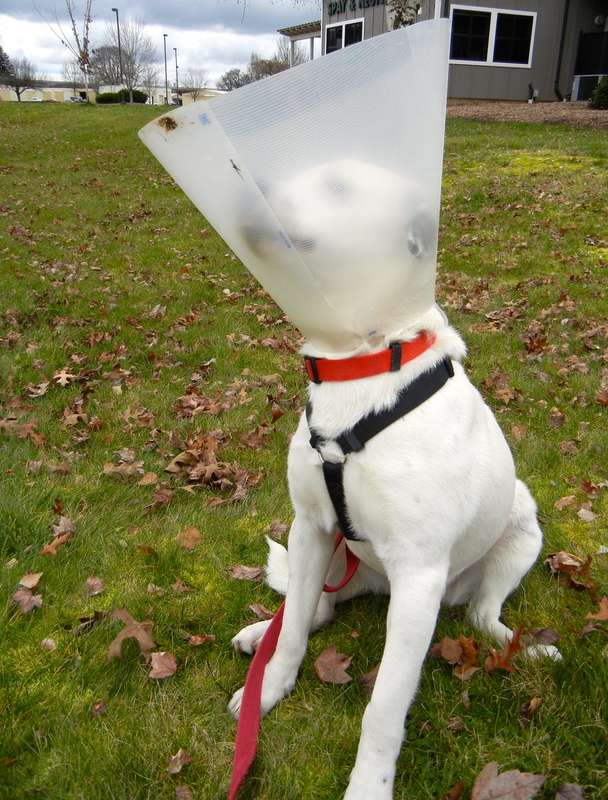 Since he was just neutered, he has to wear a cone, but unlike a lot of dogs, he doesn’t seem to mind it much. He had a wonderful time in play group on Sunday; he especially likes playing with small dogs, as you saw in the cartoons above. 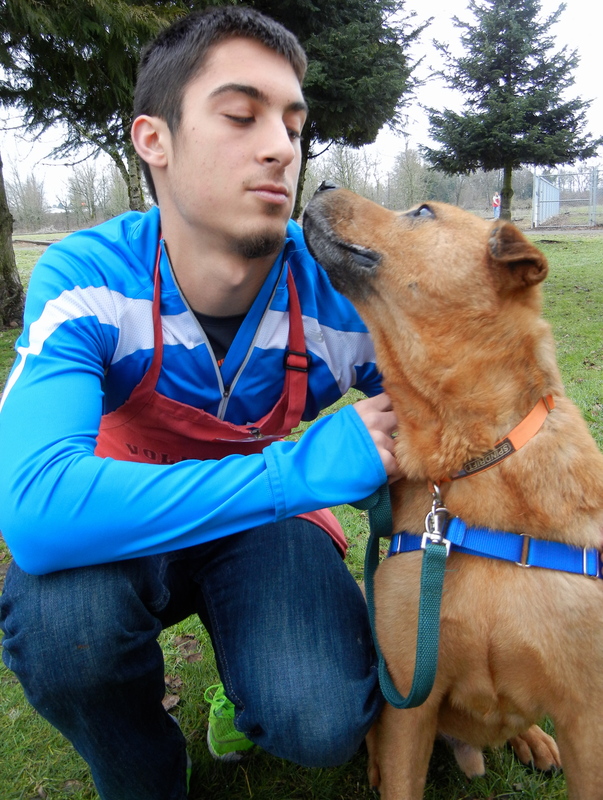 Comet is shy at first with a new person, but it doesn’t take long before he is leaning up against you for scratches. 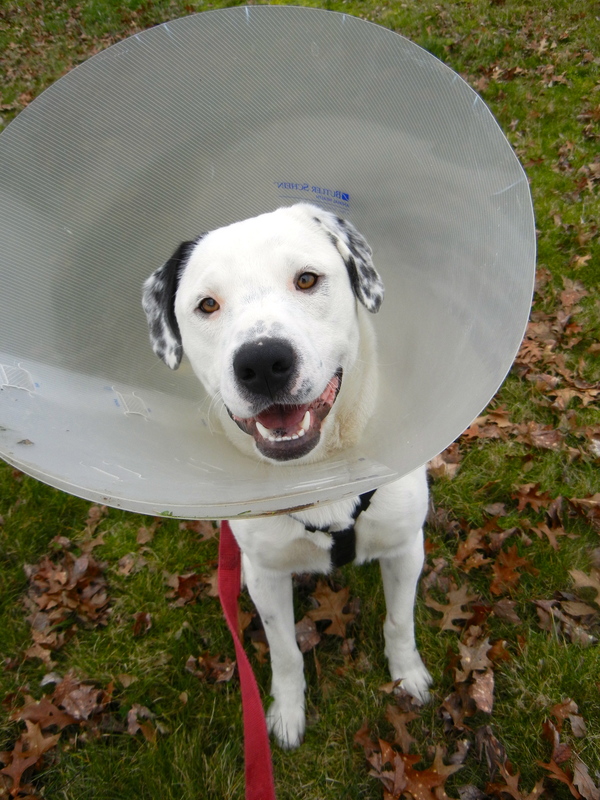 He is a two-year-old Lab/Dalmatian mix. Here is a series of pictures taken today which show some of his personality. Some family will be very lucky to adopt him! 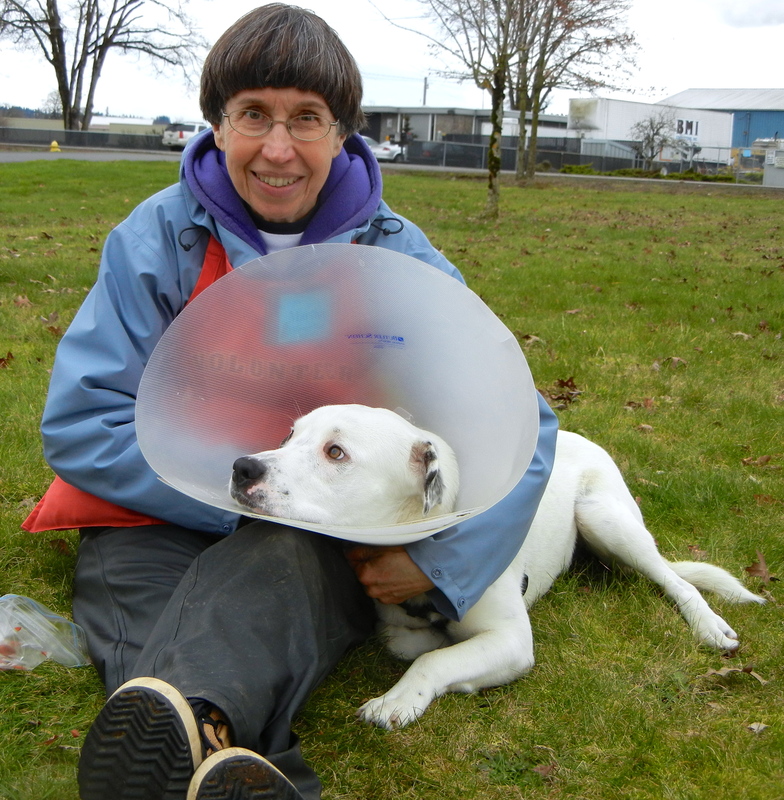 I was delighted last week when I got an email and pictures about a WHS dog I had never met. 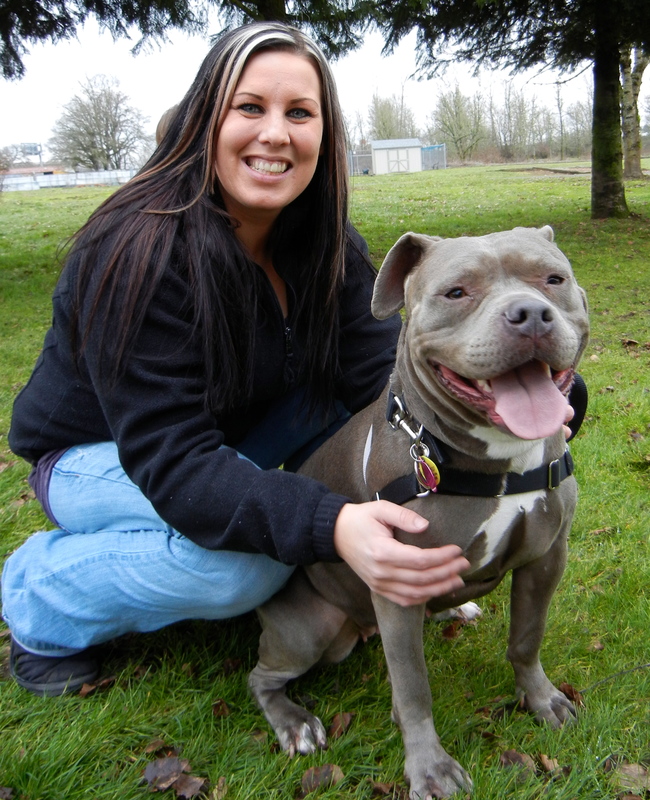 Lulu’s owner wanted to share her story with you and I am very happy to do so! Thanks, Ryleigh, for writing! Lulu came into our house at a foster puppy in October of 2012. She was only supposed to be with us for about 2 weeks, until she was old enough to be spayed. 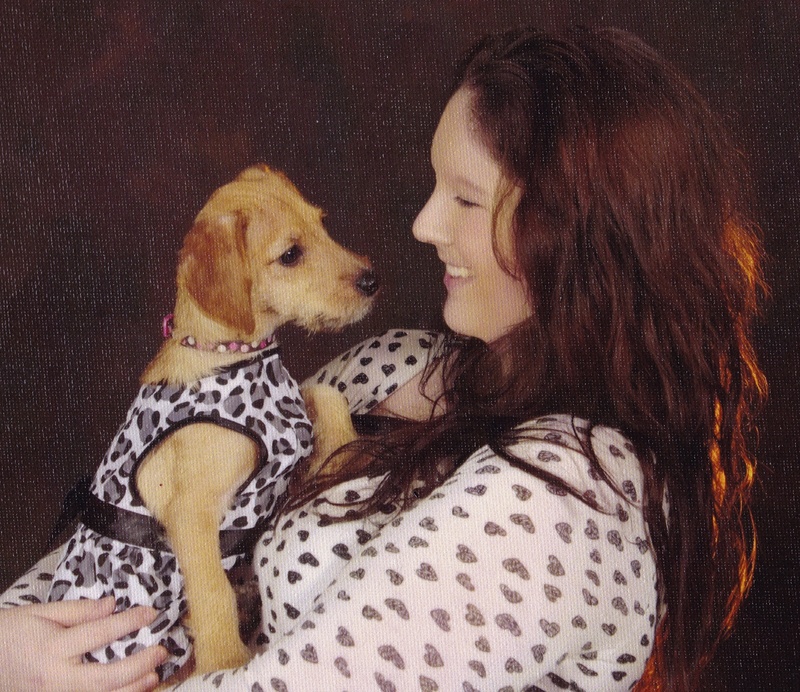 Everyone in our family fell in love with her instantly. Even the cats. Lulu is now about 6 months old and the most spoiled puppy there is. She goes absolutely everywhere with me, she even has her own doggy car seat. She sleeps with me every night and always takes up as much of the bed as she can. 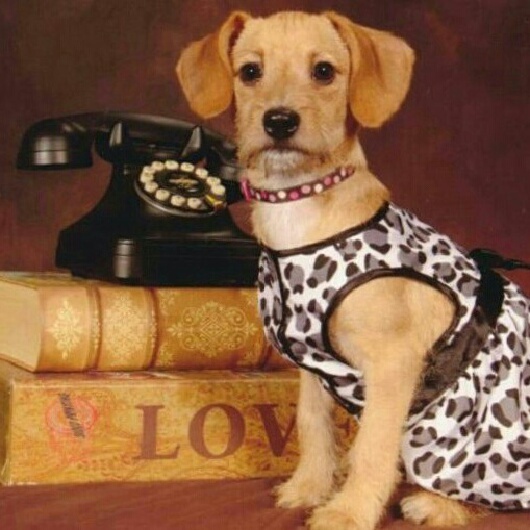 She has has an endless amount of doggy sweaters and dresses, and even had a special dress to wear to take pictures with Santa when he came to the humane society. Since Lulu was adopted from her foster home rather than at the shelter I wanted to share her story with everyone who didn’t have the chance to meet her. She is my best friend and an amazing addition to our family. I was busy taking pictures of new dogs on Sunday when staff member Connie excitedly told me that Mary’s family was looking for me to say hi! Needless to say, I was thrilled. It was such a happy surprise to see everyone: Mary, Heather and little Kayia! Of course I had to take some pictures to show you! We all had a great visit and Mary got to see many of her WHS fans. It was obviously an exhausting afternoon, as Heather sent me this photo later that night! Heather promised to stop in again another time! And that’s it for this week! I’ll write another post on March 6. 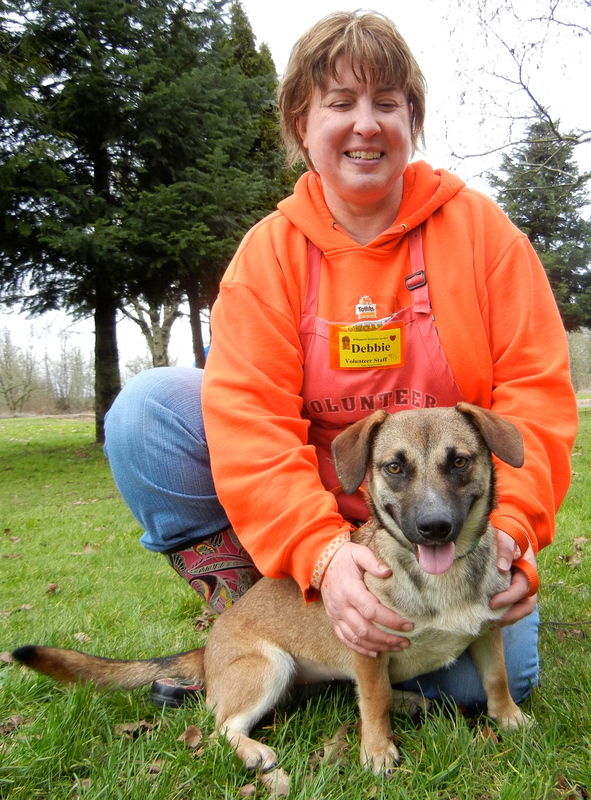 Lulu was adopted through the Willamette Humane Society. I just love this newsletter and all the comments and just the way you put it together. I look forward to it every time it comes out. Great job everyone. What a wonderful place you have there. Thank you, Lois! Your comment means a lot! I L-O-V-E Comet!!! Bet he gets a great home soon! You all at WHS are the best ! Way to go Karen for taking Rockstar..I mean Tanner!!! I agree with Lois, Martha- I love the “thinking clouds”.Great! I just bet the dogs really ARE thinking those things!! Another great blog; how will we be entertained with you gone, and how will the dogs get their publicity? But you need some time to yourself also. So fun to see Tanner(AKA Rockstar) in his new potential home. It is so natural for a dog to be upset in a new crate. It was great to see Mary and her new people again; she looks so cuddly.